You are here: Home › Blogs › Community › The 2018 LibrePlanet keynotes are here -- you won't want to miss them! The 2018 LibrePlanet keynotes are here -- you won't want to miss them! The tenth annual LibrePlanet free software conference is just two months away, and we've got a slate of fantastic keynote speakers for you! 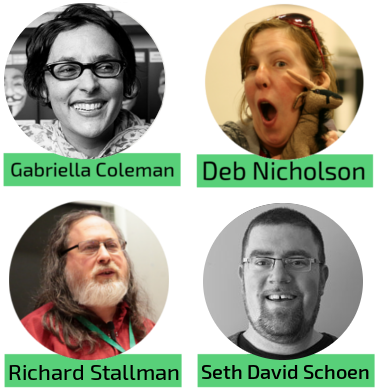 This year at LibrePlanet 2018, you can hear talks by anthropologist and author Gabriella Coleman, free software policy expert and community advocate Deb Nicholson, Electronic Frontier Foundation (EFF) senior staff technologist Seth Schoen, and of course, FSF founder and president Richard Stallman. Register for this year's conference here! Gabriella (Biella) Coleman is best known in the free software community for her book Coding Freedom: The Ethics and Aesthetics of Hacking. Trained as an anthropologist, Coleman holds the Wolfe Chair in Scientific and Technological Literacy at McGill University. Her scholarship explores the intersection of the cultures of hacking and politics, with a focus on the sociopolitical implications of the free software movement and the digital protest ensemble Anonymous, the latter in her book Hacker, Hoaxer, Whistleblower, Spy: The Many Faces of Anonymous. Deb Nicholson is a free software policy expert and a passionate community advocate, notably contributing to GNU MediaGoblin and OpenHatch. She is the Community Outreach Director for the Open Invention Network, the world's largest patent non-aggression community, which serves the kernel Linux, GNU, Android, and other key free software projects. A perennial speaker at LibrePlanet, this is Nicholson's first keynote at the conference. Seth David Schoen has worked at the EFF for over a decade, creating the Staff Technologist position and helping other technologists understand the civil liberties implications of their work, helping EFF staff better understand technology related to EFF's legal work, and helping the public understand what the products they use really do. Schoen last spoke at LibrePlanet in 2015, when he introduced Let's Encrypt, the automated, free software-based certificate authority. FSF president Richard Stallman will present the Free Software Awards, and discuss pressing threats and important opportunities for software freedom. LibrePlanet is an annual conference for people who care about their digital freedoms, bringing together software developers, policy experts, activists, and computer users to learn skills, share accomplishments, and tackle challenges facing the free software movement. The theme of this year's conference is Freedom. Embedded. In a society reliant on embedded systems -- in cars, digital watches, traffic lights, and even within our bodies -- how do we defend computer user freedom, protect ourselves against corporate and government surveillance, and move toward a freer world? LibrePlanet 2018 will feature sessions for all ages and experience levels. For the fifth year in a row, LibrePlanet will be co-presented by the Free Software Foundation and MIT's Student Information Processing Board (SIPB), and we can't wait to see you all at this vibrant gathering of free software enthusiasts. The rest of the LibrePlanet program will be announced soon. The opening keynote at LibrePlanet 2017 was given by Kade Crockford, Director of the Technology for Liberty Program at the ACLU of Massachusetts, and the closing keynote was given by Sumana Harihareswara, founder of Changeset Consulting. Registration for LibrePlanet is now open, and admission is gratis for Free Software Foundation members and students. Not a member? Join today for gratis admission to LibrePlanet and other exclusive benefits.